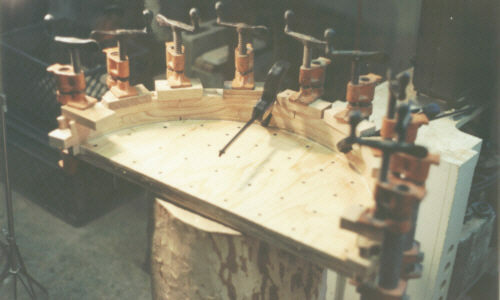 This shows the glue-up process for the curve feature of this cabinet. The individual pieces interlock into a large semi curcular shape. 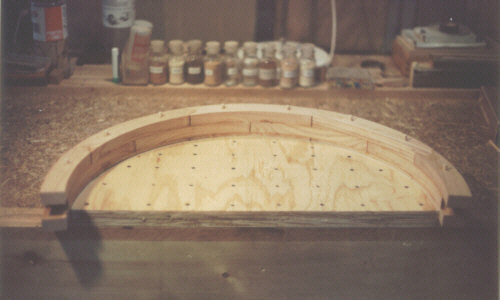 The pieces are held in position by the form while small dowels are placed into the locating holes in each piece. Each row is staggered to create a very strong glue joint, the same way bricks are layed when building a wall. Many clamps are needed too apply uniform pressure so the layers glue up evenly.